I'll see what I can find. It's the least I can do for the great pics of 'O Uma-jirushi'. So far, I've sorted out and grouped together 57 sets, of which I've identified 35. Strangely, a set from the pics that looked Shimazu appear to be named as Matsudaira. Many thanks. I'm eager to know how many families are represented. That Matsudaira set could be Shimazu Tadatsune perhaps. 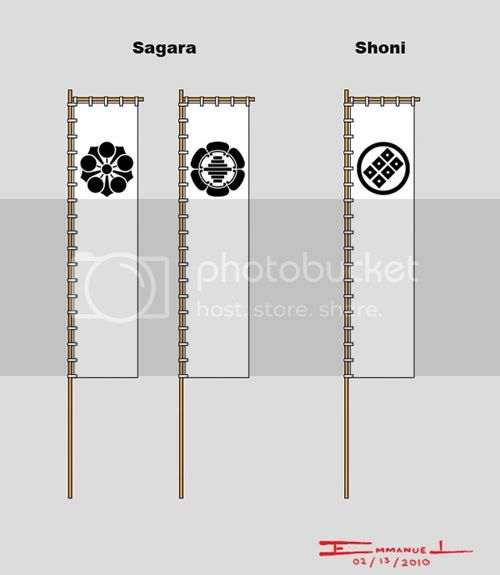 Shimazu plates have been added in page 5 of 'Samurai Heraldry Gallery'. Some of the greater tozama daimyo were given the honorary name Matsudaira. I know the Môri of Chôshû and the Maeda of Kaga were. Since the Môri were, it is not be surprising that the Shimazu were given it, also. Looking through the fantastic images of O Uma Jirushi posted earlier I was struck by the number of standards which utilise a kabuto mounted on a pole. Was this an Edo period thing or did any Sengoku period families actually use these during that time. I cannot recall having seen any imagaes posted anywhere showing such standards. The O Uma Jirushi showed not only the standards of the major daimyo of the time, but also their kabuto if known. The helmets could have been used as standards as well if they weren't presently being used. If the daimyo were at "rest" for instance. 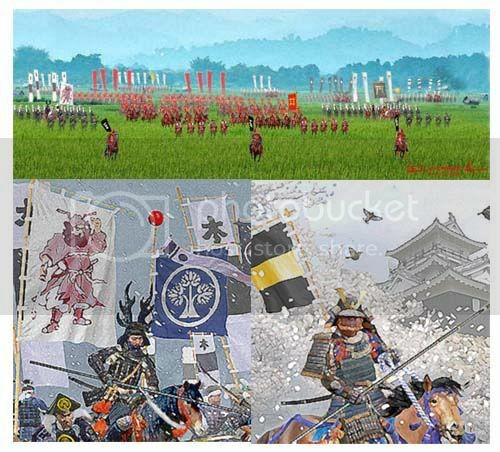 If you look closely at screen paintings of Nagashino, you'll see that Oda Nobunaga's helmet is being used as a standard. I don't have a link unfortunately. I imagine it would have been a practice at camp or on the march. I admit I don't know everything about the subject. When the daimyo is not wearing his kabuto an attendant might display it like a standard, in camp or when the army is on the march. When battle begins the daimyo would wear the kabuto. If you look closely at screen paintings of Kawanakajima, you'll see that Oda Nobunaga's helmet is being used as a standard. Now THAT would be an historical find of note! Are you maybe thinking of the Nagashino screen painting? Yes, my mistake. I meant Nagashino. I haven't found anything yet for the Sagara and the Shoni. All I could find were possible mon. The Sagara mon is described in The Sourcebook (nobori #1). The illustration below are pure guesswork, using the most basic design. Could anyone translate what is written on these banners? Any help would be appreciated. Thank you. Thanks to K. Morita san, the left hand banner reads "Aizen Myo-o"
The nobori in question are part of a personal project of Uesugi Kenshin and his 'generals'. Naoe Kanetsugu's nobori above can now be seen on page 6. Brand new Uesugi Kenshin banners are in the works. On page 46 of "Samurai Heraldry" Turnbull shows him next to a white rabbit/hare on red background standard, on a picture described as from an Osaka screen. He personally is showing his usual standard. Is this also a Mogami standard or is he being potrayed whilst passing another clan. If so. does anyone know who it belongs to? "Sengoku Bushou, Kamon, Hata, Umajirushi 100 files" written by "Ohno Nobunaga"
PS: odly enough, he wrote "Shimadu" insteed of "Shimazu" and "Toyotomino" insteed of "Toyotomi" .... Is there a variation of the Romanji translation? Yes, Max, there are several ways of romanization. The Romaji for Shimazu has been Shimadzu in the past, and the Japanese might even be tempted to write Shimadu, depending partly on how they envision their keyboard. Toyotomi is the same, but if you add 'no' to it, then it can simply mean something like 'of', a kind of possessive pronoun, or a simple linkage. It would probably be easier understand if people used hyphens and wrote 'Toyotomi-no-(somethingsomething)'. This is the book Max is referring to. 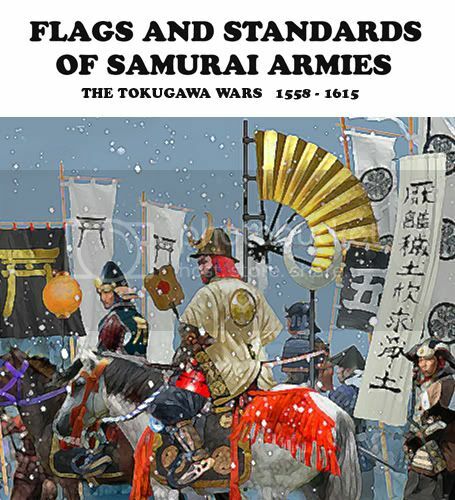 It's published by Gakken, the same company that releases all those Rekishi Gunzō books. I got this last December and can say that it is a great resource. Eval, before somebody beats you to the punch, you better put something out in English. Quit posting your plates here and publish a book that is somehow distinguishably different from Gakken, apart from the language. Do it, please! And yes, there are some issues with the romaji in the book, but it's only a minor irritant. Gakken has never been very good at being consistent with romanization styles or really checking to see if the English they use, when they use it, makes sense to native speakers. But all this info and color plates for only 600 yen, who is going to complain? The sets I've posted are a small fraction of what I have already identified. Unidentified sets may outnumber them. Trying to find a biography for names I've just come across for the first time and how they may fit in the 'big picture'. I don't read Japanese well, so the progress is slow. Trying to find the original source to verify them. Most books out there don't have 'complete' sets. Trying to find that missing sashimono for specific sets... Gakken books also sometimes contradict each other. I need a ton of help with translations. I've separated my files into SIX specific 'eras' of the Sengoku period to make them manageable. In chronological order and in order of battle. If I do books, they will be according to the files. The first file, trying to find the sets for Shinano warlords that Takeda Shingen defeated, the sets for Uesugi Kenshin's generals and the Hojo's colorful army. As many as 70 sets to illustrate. A very small portion is on page 6 on the Heraldry Gallery. Toyotomi Hideyoshi's file may take two books or even three books! 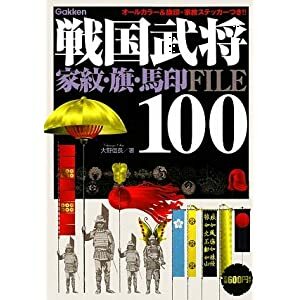 The file on the siege of Osaka and the Shimabarra Rebellion have large numbers of sets that don't appear earlier, or have 'evolved' since. The translations often have me walking away from all these for months. I think i can say that we all highly appreciate you hard and beautiful work. I would like to offer my help but my japanese is really too weak to be of any help! And if you want Aoyama clan Edo period standards and jinbaori, here you go-- from my photos. I wholeheartedly join in Obenjo's plea, please put your excellent work in print before osprey and Dr T flood the market! Max, I have copies of several versions of the link you posted. Almost halfway through sorting them into the correct sets and have identified more than half of them. If someone else comes up with a new heraldry book, I will be the first one to buy it. With 25 years of sketches of samurai battles with 'blank spaces' in place of heraldry, I am happy just filling in the blank spaces. NOTE: All artwork above would have to be redrawn, corrections done to some of the heraldry because of new information from recent books. Obenjo, thank you. I can add them to the Aoyama set I have to get a more complete set. Can you tell me the meaning of the writing for each flag?